Amazon is great. 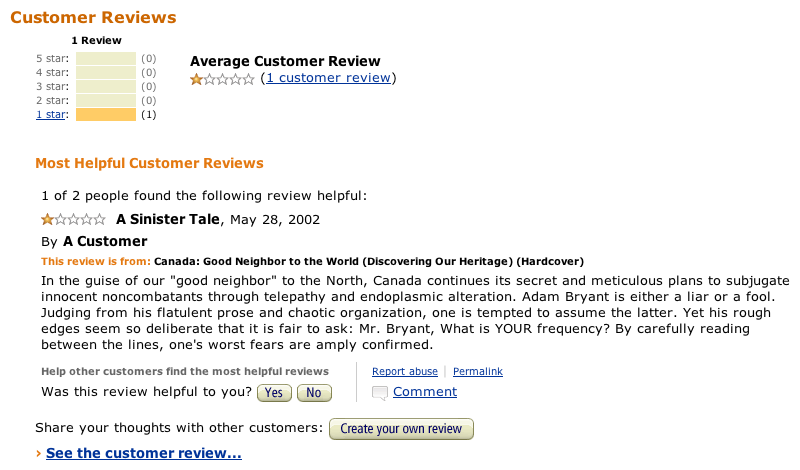 The reviews are sometimes awesome, like this for Canada: Good Neighbor to the World. Grade 3-6 A broad overview of multicultural Canada, focusing primarily on the present, but supported by excursions into the cultural history of Canada’s European settlers. The native population gets relatively short shrift. The book includes chapters on ethnic composition, legends, holidays, foods, education, and sports. While it touches on such standard school-report topics, these are presented from the perspective of their basis in or impact on cultural or ethnic consideration in insufficient depth to serve as a single source. The index, which sometimes supplies incorrect page numbers, does not lead to some subjects found in the text (free-trade, for instance). In the guise of our “good neighbor” to the North, Canada continues its secret and meticulous plans to subjugate innocent noncombatants through telepathy and endoplasmic alteration. Adam Bryant is either a liar or a fool. Judging from his flatulent prose and chaotic organization, one is tempted to assume the latter. Yet his rough edges seem so deliberate that it is fair to ask: Mr. Bryant, What is YOUR frequency? By carefully reading between the lines, one’s worst fears are amply confirmed. You tell them, A Customer. Flautent prose and meticulous plans to subjugate innocent noncombatants through telepathy and endoplasmic alteration. We can only assume washrooms, hosers, and Wayne Gretzky are also involved.